In this article we will show how to use and change aggregate functions in RadPivotGrid and RadPivotFieldList. Different aggregate functions are available only for LocalDataSourceProvider. 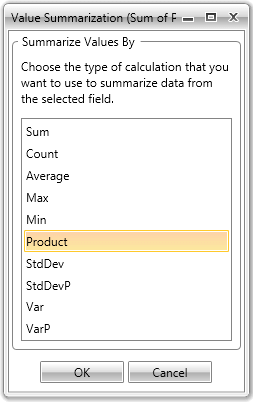 When your data source is OLAP Cube, the data is already aggregated in it and you cannot apply new aggregate function. In our application we will use a very simple ItemsSource for our LocalDataSourceProvider and we will change only the aggregated functions just to show the different result in RadPivotGrid. We will use Name as RowGroupDescription, Promotion as ColumnGroupDescription and Price as AggregateDescription. Data is aggregated in the cells - check the red rectangle - it shows 23.03 which is the average of the values for all Notebooks with Extra Discount promotions. GrandTotals use the same aggregate function - as you can see in the Green and Blue rectangles, GrandTotals for Rows and Columns are using the same aggregate function - average. So in the Blue rectange you can see that the average price of all products with Free shipping promotion is 13.67. In the Green rectangle you can check easily that the average price of all Pens is 10.86. The average of GrandTotals for columns is the same as average of GrandTotals for rows. The value in the bottom right corner is calculated with the aggregate function applied on the GrandTotals. There shouldn't be any difference whether you apply the aggregate function on the GrandTotals of the rows or of the columns. Average - this function will sum all data and then divide it to the number of items. For example we have three products "Pen" with "Extra Discount" promotion. In RadPivotGrid you can see the average price. The calculation is simple - sum the prices of the three products (10.61 + 10.82 + 11.24 = 32.67). Now divide it to the count of items (32.67 / 3 = 10.89). Max - this function will show the highest value of all possible for the current cell - for product "Pen" with "Extra Discount" promotion we have prices 10.61, 10.82, 11.24. The highest value is 11.24 so it will be shown in the cell. Min - this function will show the lowest value of all possible for the current cell - for product "Pen" with "Extra Discount" promotion we have prices 10.61, 10.82, 11.24. The lowest value is 10.61 so it will be shown in the cell. Sum - this function will sumarize all values. For product "Pen" in promotion "Extra Discount" the value in the cell will be 10.61 + 10.82 + 11.24 = 32.67. You can define Aggregate function in the XAML, in code behind or even at runtime by using RadPivotFieldList. You can change applied Aggregate Function at runtime by using RadPivotFieldList. 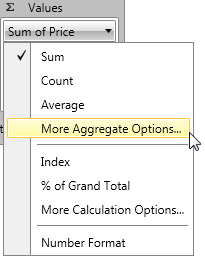 Just find the aggregate description which you want to modify in the "Values" list and click on it - some of the aggregate functions are listed there, but if you don't see the one you need - click on "More aggregate Options..." item and a new dialog RadWindow will open. In it you will find all predefined Aggregate Functions.